The study looked at data from more than 45,000 women who were initially free of cancer, heart disease, and type 2 diabetes, and assessed their eating patterns over a six-year period. Those who chose to forego breakfast but ate frequently (four or more times a day) had a greater risk of developing diabetes, while a lower body mass index (BMI) seemed to mitigate some of the danger associated with irregular breakfast consumption. Translation: skipping breakfast isn’t a smart idea for anyone, but seems to be even more harmful for those who are overweight. According to the study, male breakfast skippers are also at risk. Another recent large scale study shows a similar effect on men. After tracking over 29,000 men for 16 years, researchers found that men who skipped breakfast had a 21 percent higher risk of developing diabetes. Other researchers have come to similar conclusions, hypothesizing that breakfast may play a role in stabilizing blood sugar levels throughout the day. 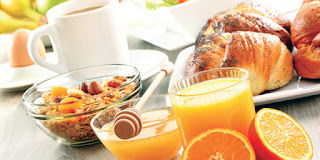 In fact, a new but much smaller study showed that eating breakfast reduces overall diabetes risk for overweight women. Insulin levels were higher after missing breakfast, and researchers believe that missing that meal may lead to insulin resistance, the root cause of type 2 diabetes.